Link Space Aerospace Technology- Medium Reusable carrier rockets..
On a very spring day of 27th March 2019 LinkSpace in which is among sixty more Private Space Companies in China …. Link Space Aerospace Technology, a Beijing based Private Space Commercial Company among sixty more in China.. have successfully tested there small version of what’s to come with an larger reusable carrier rocket that’s set out to become like of Space X Falcon Nine Reusable, also its heavier variants, among in the reusable Carrier Rocket Development is the next generation of CNSA- China National Space Administration Heavier Long March reusable Carrier in the eight, nine series..
On July 2016 the company have achieved the required means of Rocket retro Technologies, on using a single vector control engine… in which leading to controlling engine thrust on recovering the Carrier Rocket stage to reused again to lower the cost involved in sending a payload into orbital means on the same launched design heritage among Space X , Blue Origins…..located in heart of Beijing Economic Technological Development Area… also they located in the Beijing, Guangdong, Shandong, Shaanxi ..
During the early this year they successful tested a short range smaller scale of the initial size of their carrier rocket from VT-VL- Vertical Take-off towards Vertical- Landing… at their testing facilities in which they being Home Made designing since founded on 2014 January from many whom worked within the Aerospace and space industry in China..
image credit Xinhua – launching of the Iconic reliable Long March 3B rocket in deploying the second Tialian Communications relay satellite. 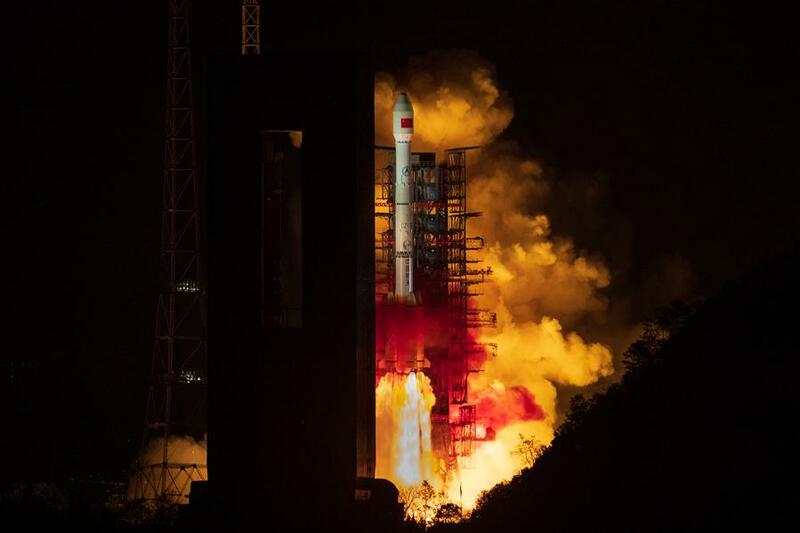 On 31st March 2019- Sunday, CNSA – China National Space Administration have successfully launched its iconic reliable Long March 3B Carrier rocket in delivering an advance Data tracking Telecommunications Satellite…. In which launched without any issues on almost midnight 23:51 Beijing time … it is the 301st mission of the launching of the long march Carrier Rocket series….. Launching the Long March 3B series carrier rocket into Geo Stationary orbit in launched from the CNSA’s Xichang Satellite Launch Centre in Sichuan Province.. Launching from the centre it the Tianlian II -02 Satellite is the second generation from its previous sister, designed, manufactured by the CAST- China Academy of Space Technology, building on trustworthy Tianlian II-01 DFH-4 framework in which the third sister will join up latterly to form a constellation. That it’s provisionment is to provide advance extremely high velocity telecommunications data relaying in which that will assistance with the communications network with the newly soon built Tiangong one Space Laboratory with the Shenzhou crew command module..
As Cathay Pacific Airways does the sound of a Life well-Travelled- travelling well in capturing timeless sounds the destinations that travel towards.. in which HSBC –Hong Kong Shanghai Bank Corporation does the same in capturing the sounds that’s cheering for the Hong Kong Sevens that taken place in between the fifth towards the seventh of April 2019.. In which it storytelling of the iconic sounds of Hong Kong with the Ding Dings- Hong Kong international iconic trams- Hong Kong Tramways.. the Musically narrative story writes towards the living beats of the streets, towards the living sounds of the people of Hong Kong in which towards the cheering crowds of the stadium with cheering energy of loving Hong Kong as they celebrated like nobody does rugby sevens like Hong Kong..
in which they too will be celebrating as one of the key founding sponsors of the Hong Kong Seven 2019 in celebrating along with Cathay Pacific in one of the many highest profile events in the Hong Kong SAR region in which Hong Kong Shanghai Bank –Hong Kong help to support the spotlighting of the startup innovations and innotech of some HSBC-Hong Kong business customers at the Hong Kong Sevens to show case that is an international major Hub Hong Kong innovation for startups..
#CathayPacific #國泰航空公司 |#紐約 #NewYork #FoodItinerary #OriginalSeries – where to find the best innovative east coast sweets with #CathayPacificAirways #iconic #FlightAttendants #Julia …..
Cathay Pacific Airways is coming out with always innovative interesting original travelling tips, in which the awesome international Iconic Cathay Pacific Airways cabin crew have been offering their travelling tips also favourite haunts with previously of Starlet, Phoebe Miu, Tink, also Isabel helping out on sharing their Travelling life Well Travelled experiences …. Given you have a sweet spot for Ice Creams it’s “Lucky Pickle Dumpling Co. – Upper West Side” in which their signature desert is an actual pickle soft serve, the actual is cucumber juice soft serve with a hint of pickle brine with garnishing’s of pickle chip gives a kick towards the flavourings…. For more ice cream is the Banana Pudding at “Magnolia Bakery – West Village” in which is known to have the best deserts in New York City with their iconic Banana Pudding in which consist of Vanilla Waivers, Fresh bananas, Vanilla Pudding, Sweet Condense milk with a mixture of heavy cream In which makes the pudding silky smooth delicate ….. In which the famous aftertaste of New York is its doughnut, in which its famous Crème Brulee Doughnut “Doughnut Plant- Soho” in which they take an innovative unique approach on the Doughnut… In which is filled with signature vanilla bean custard with a flame torched sugary coating which sweets the pastry in which fuses the sticky taste on the Doughnut …. Cathay Pacific Airways is coming out with some interesting original travelling tips, in which the awesome international Iconic Cathay Pacific Airways cabin crew have been offering their travelling tips with previously of Starlet, Phoebe Miu, Tink, also Isabel helping out on sharing their Travelling life Well Travelled experiences …. Currently Cathay Pacific is running a vouchering discounting coupon in which you take a screen shot per second in which taking a screen shot in one second has a redeemable coupon in which you get discounts for the adventurous exploration around Hong Kong for a limited time only with conditions apply.. Deals that help you discover more Deals that help you experience more of Already Tomorrow In Hong Kong..
City Travel– ten percent of Big foot tours. Entertainment – fifty percent off on two tickets at Madame Tussauds Hong Kong. Joy – One Hundred Hong Kong Dollars off on Big Bus Tickets.